Salvatore Postiglione (1861–1906), Scene of the Narration of the Decameron (date not known), oil on canvas, 100 x 151 cm, location not known. Wikimedia Commons. As you will have gathered, I love a good story, and most of all I love it painted well, preferably by some masters spanning the period from the Renaissance to the twentieth century. We looked at some wonderful examples for Ovid’s Metamorphoses, and in many of Plutarch’s Lives. I’m still working my way through Tasso’s Jerusalem Delivered, but there’s another book which was hugely popular as a source for narrative painting over this long period: Boccaccio’s Decameron. 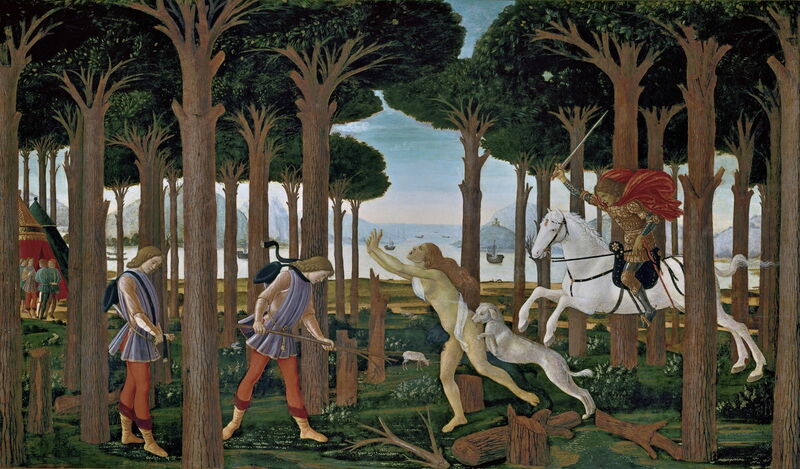 This article introduces a new series, in which I am going to look at some of the best paintings of stories selected from the hundred told there by Boccaccio. Giovanni Boccaccio’s life has been studied extensively by scholars over the last seven hundred years or so, but much of it remains very vague. He was either born in Florence, or perhaps near the village of Certaldo, to the south-west of the city. His father worked for the Bardi bank, but he is thought to have been illegitimate and his mother has never been identified. There have been rumours that she may have lived in Paris, but those now appear unlikely. We do know that he was born on 16 June 1313, and while still a child his father married a woman from a rich family, before they moved to Naples. At the time, Naples was a major cultural centre, and as a young man Boccaccio immersed himself in that. His father expected him to become a banker, and Giovanni started work as an apprentice in his father’s bank in the city, which must have brought him into contact with many colourful characters. Boccaccio had no interest in banking though, and persuaded his father to let him study canon (ecclesiastical) law at the city’s university. When he was in his twenties, his father introduced him to the Neapolitan court and cultural circles around the King of Naples, Robert the Wise. Among Boccaccio’s most important influences at this time was the scholar Paolo da Perugia, who had amassed a great deal of information about classical myths. Boccaccio himself became a scholar, particularly of the classical world, a writer rather than an ecclesiastical lawyer, and his future started to crystallise when he wrote his first poetry. His early works became the sources of Chaucer’s Troilus and Criseyde (Troilus and Cressida), and the Knight’s Tale. Boccaccio left Naples in 1341, as tensions were growing between its king and the city-state of Florence, and returned to live mainly in Florence, although he also spent time in Ravenna. He developed great admiration for the work of Dante Alighieri, who had died in Ravenna in 1321, and the great poet Francesco Petrarca (Petrarch) (1304-1374), whom he regarded as his teacher. Giorgio Vasari (1511–1578), Six Tuscan Poets (1544), oil on panel, 132 x 131.1 cm, Minneapolis Institute of Arts, Minneapolis, MN. Wikimedia Commons. Giorgio Vasari is most famous for writing biographies of many of the important painters of the Renaissance and earlier, but was also a very accomplished artist himself. His tribute to some of the greatest writers of the period is Six Tuscan Poets from 1544. 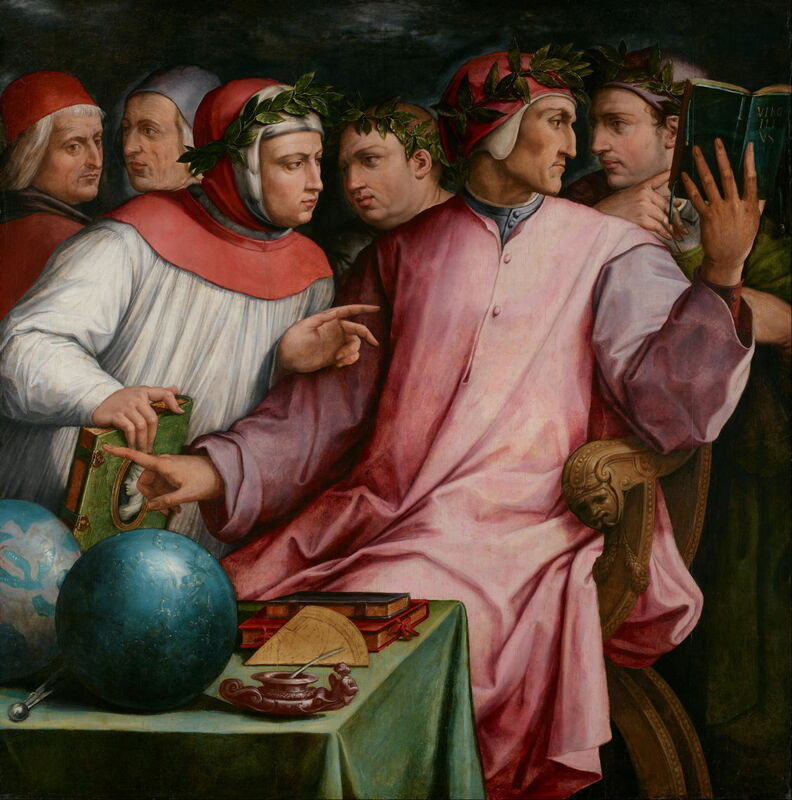 From left to right, I believe these to be Dante Alighieri, Francesco Petrarca (Petrarch), Guido Cavalcanti, Giovanni Boccaccio, Cino da Pistoia, and Guittone d’Arezzo. Dante, Petrarch and Boccaccio remain three of the greatest European writers of all time. 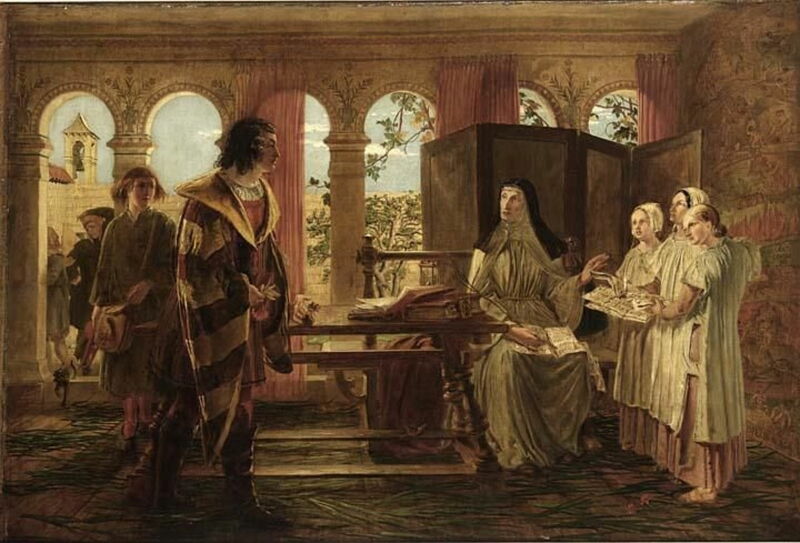 William Bell Scott (1811–1890), Boccaccio’s Visit to Dante’s Daughter (date not known), oil on canvas, further details not known. Wikimedia Commons. William Bell Scott’s undated painting of Boccaccio’s Visit to Dante’s Daughter shows the writer paying indirect homage to his illustrious predecessor. Boccaccio wrote the first biography of Dante, at about the time that he was writing the Decameron. During the 1340s, Boccaccio seems to have been developing the idea of a book in which seven characters take it in turns to tell stories. When the Black Death struck Florence in 1348, even killing Boccaccio’s stepmother, this provided him with the framing story. He was already building his collection of tales which would form the bulk of the book, and it is thought that he started writing it shortly after the Black Death. What is more doubtful is whether Boccaccio was living in Florence when the Black Death struck. However, as it raged through the whole of Tuscany in that year, hardly sparing a village, it is most unlikely that he didn’t observe its effects somewhere, possibly in Ravenna. In 1349, Boccaccio’s father died, leaving Giovanni as the head of the household. In spite of that, he pressed on and had largely completed the first version in 1352. He revised it in 1370-71, and from then on it has been widely read, translated into all major languages, and its stories have inspired many other works of art. Egide Charles Gustave Wappers (1803–1874), Boccaccio Reading from the Decameron to Queen Johanna of Naples (1849), oil on canvas, 171 x 228 cm, Koninklijke Musea voor Schone Kunsten van België / Musées Royaux des Beaux Arts de Belgique, Brussels, Belgium. Image by Georges Jansoone, via Wikimedia Commons. Egide Charles Gustave Wappers painted Boccaccio Reading from the Decameron to Queen Johanna of Naples in 1849. It shows Queen Joanna I of Naples (1328-1382), whose reputation at the time was controversial to say the least. However, Boccaccio was her supporter, and wrote a complementary account in his collection of biographies of famous women, De Mulieribus Claris (On Famous Women). Whether he ever read to her from his Decameron is more speculative. 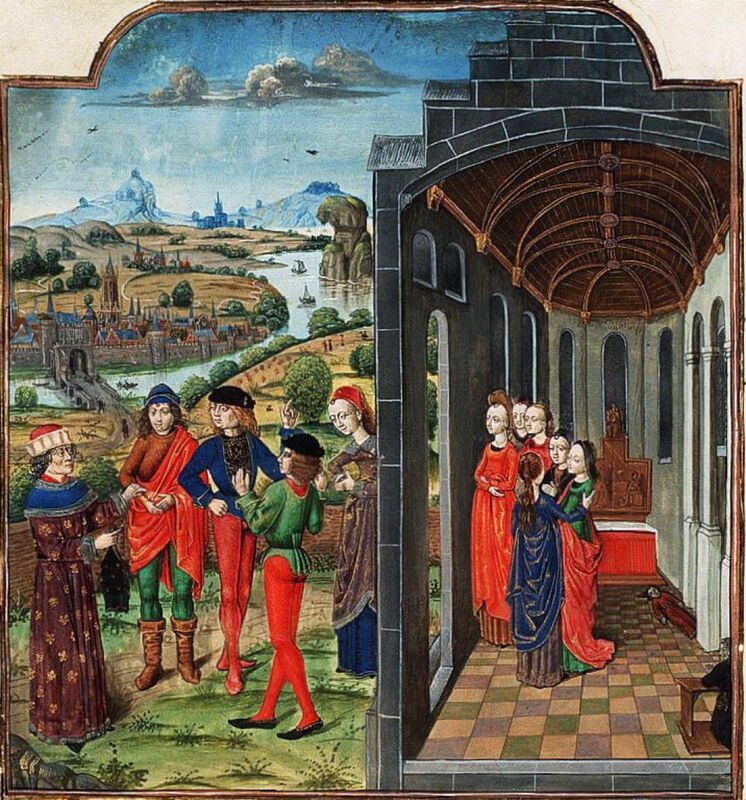 Master of 1482 and Follower (fl 1485), Giovanni Boccaccio and Florentines who have Fled from the Plague (c 1485), miniature on vellum, in The Decameron, translated by Laurent de Premierfait, Koninklijke Bibliotheek, The Hague, The Netherlands. Wikimedia Commons. This miniature by the Master of 1482 and Follower conflates Boccaccio, the Black Death in Florence, and the framing story of the Decameron: Giovanni Boccaccio and Florentines who have Fled from the Plague was painted in about 1485 on vellum, in what must have been one of the first illustrated versions of The Decameron. The Decameron opens with a description of the horrific conditions and events which overwhelmed Florence when the Black Death struck, then takes us to a group of seven young women who are taking shelter in one of its great churches. They decide to leave the city, rather than waiting amidst its rising pile of corpses, to spend some time in the country nearby. To accompany them, they take a few servants, and three young men. Once settled in an abandoned mansion, the ten decide that one of the means by which they will pass their self-imposed exile is by telling one another stories. Over the next two weeks, each tells one story on every weekday, providing a total of one hundred in all. Raffaello Sorbi (1844–1931), The Decameron (1876), oil on canvas, 45.5 x 88.7 cm, Private collection. Wikimedia Commons. 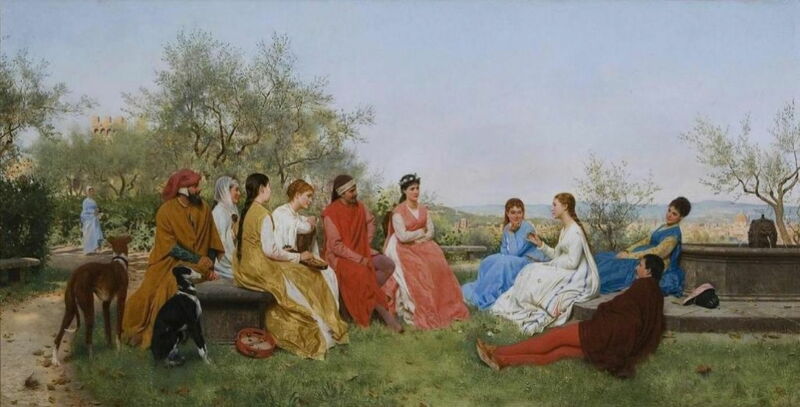 Raffaello Sorbi show the group of ten during one of the story-telling sessions in The Decameron from 1876. The city of Florence is in the distance. Salvatore Postiglione’s undated, ornate and almost illustrative Scene of the Narration of the Decameron is unusual for omitting one of the seven young women, but links visually to their other musical and craft activities. Relatively few of the hundred tales in the Decameron have been committed to paint. Some are little more than brief fables, or what used to be known as shaggy dog stories. Others are more lengthy novellas with intricate twisting plots. But many have been painted, from the Renaissance until well into the twentieth century. They were particularly popular sources of motifs among the Pre-Raphaelites and other nineteenth century artists. Francesco Pesellino (1422–1457), Scene from the Life of the Griseldis (c 1450), tempera on panel, 42 × 47 cm, Accademia Carrara, Bergamo, Italy. Wikimedia Commons. The tale of Griselda has cropped up in folk stories across Europe before it was told as the final tale (Day 10, Story 10) of the Decameron. It was then taken up by Chaucer in the Clerk’s Tale, and by Charles Perrault. Francesco Pesellino depicted it in this Scene from the Life of the Griseldis painted around 1450. Sandro Botticelli (1445–1510), The Story of Nastagio Degli Onesti I (1482-83), tempera on panel, 83 x 138 cm, Museo Nacional del Prado, Madrid, Spain. Wikimedia Commons. One of the most significant series of paintings of the Decameron is Sandro Botticelli’s The Story of Nastagio Degli Onesti, of which this is the first. Boccaccio includes this horrific tale as the eighth story on Day 5, which Botticelli shows in four panels which were commissioned as a wedding gift for a couple whose marriage was partly arranged by Lorenzo the Magnificent (Lorenzo de’ Medici), ruler of the Florentine Republic in the late fifteenth century, and Botticelli’s patron. They were completed during 1482-83. Some paintings of stories from the Decameron aren’t as clearly associated with Boccaccio’s words: I am going to try to associate George Frederic Watts’ A Story from Boccaccio from 1844–47 with the tale that it tells. 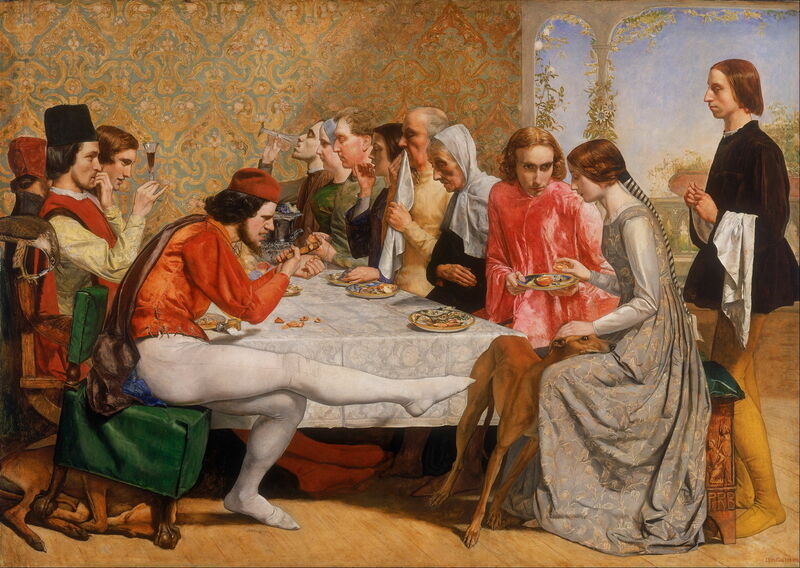 John Everett Millais (1829–1896), Isabella (Lorenzo and Isabella) (1848-49), oil on canvas, 103 x 142.8 cm, Walker Art Gallery, Liverpool, England. Wikimedia Commons. One of the earliest and greatest examples of Pre-Raphaelite painting is John Everett Millais’ Isabella (Lorenzo and Isabella) from 1848-49. 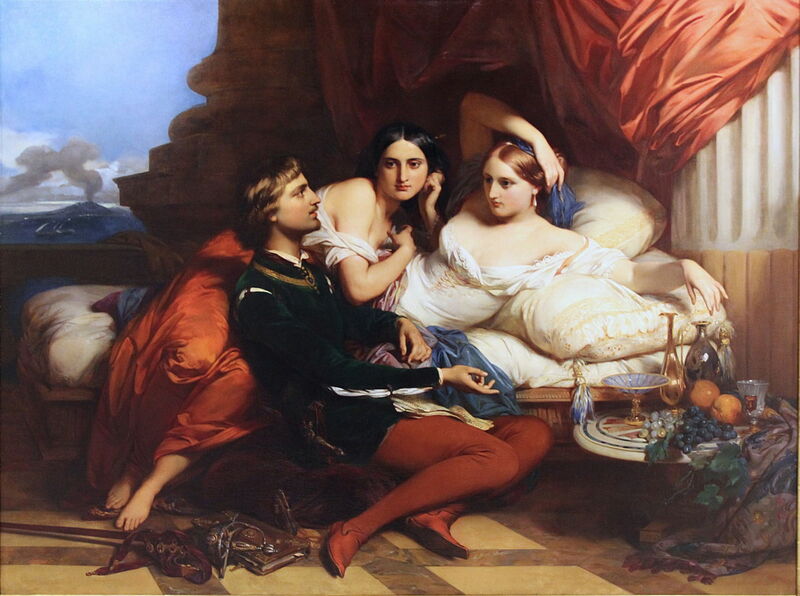 When exhibited at the Royal Academy in 1849, it was accompanied by lines from John Keats’ poem Isabella or the Pot of Basil, which refers to the story of the ill-fated love of Lisabetta for Lorenzo, the fifth told on Day 4. Marie Spartali Stillman (1844–1927), The Enchanted Garden of Messer Ansaldo (1889), watercolour and gouache on paper mounted on panel, 72.4 × 102.9 cm, Private collection. Image courtesy of Julian Hartnoll, Pre‑Raphaelite Inc., via Wikimedia Commons. 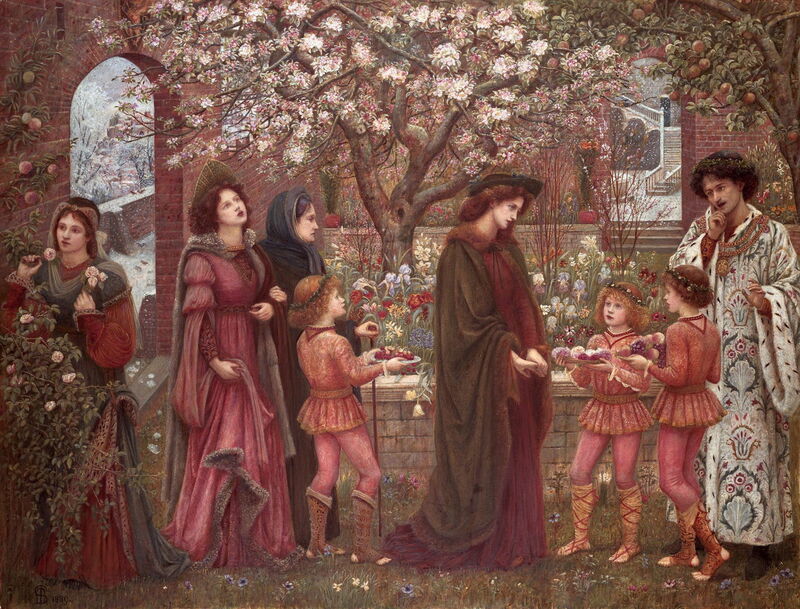 Later in the nineteenth century, Marie Spartali Stillman painted The Enchanted Garden of Messer Ansaldo (1889), showing a scene from the fifth story of Day Ten. This was also painted by John William Waterhouse in 1916-17. Perhaps the most popular of all the stories in the Decameron with visual artists has been the romance of Cymon and Iphigenia, here shown in Frederic, Lord Leighton’s luscious and languid painting from 1884. 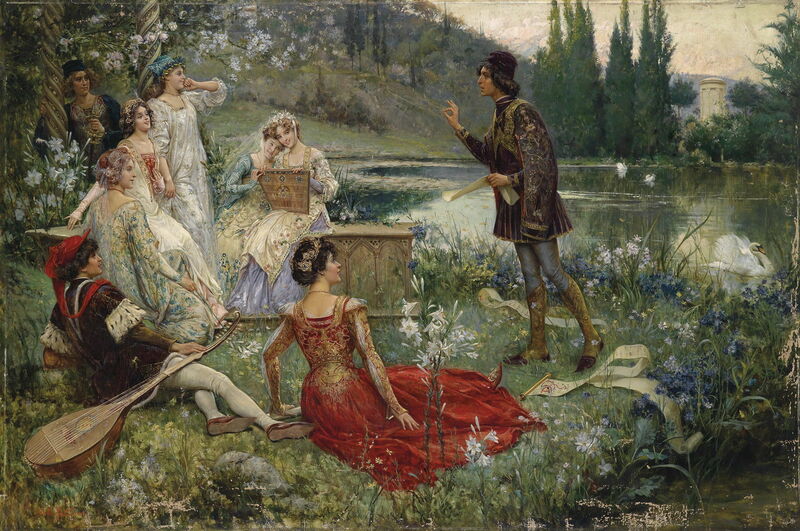 I hope that you will join me in looking at many more wonderful paintings exploring Boccaccio’s stories from the Decameron in the coming weeks. Posted in General, Language, Life, Painting and tagged Boccaccio, Botticelli, Decameron, Florence, Leighton, Millais, narrative, Pesellino, Postiglione, Scott, Sorbi, Stillman, Vasari, Wappers, Watts. Bookmark the permalink.